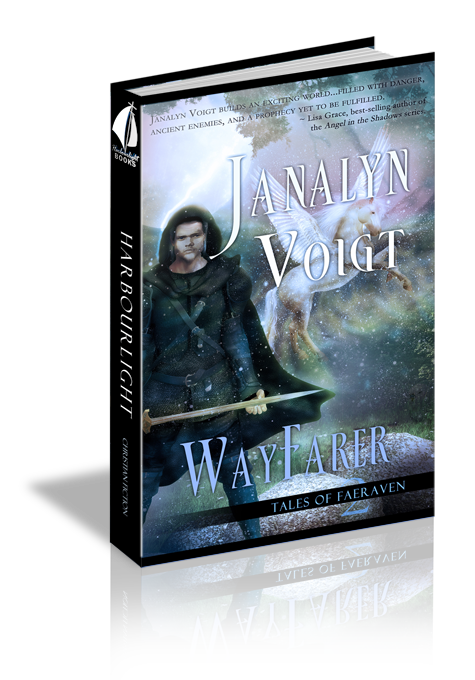 Trouble stirs between nations and rebellion threatens Faeraven. When Kai returns with the supposed DawnKing, Lof Shraen Elcon cannot trust that the Elder youth truly is the prophesied deliverer. Driven to prove himself, Elcon banishes the boy and embarks on a peace-keeping campaign into the Elder lands, where he falls in love with an Elder princess betrothed to another. Sometimes the deliverance of a nation comes only through the humility of one. Declaring his love would shame the nations, but Elcon is torn. As war approaches, Elcon's choices lead him on a journey of discovery that will either settle the lands or leave them mired in conflict. Can his kingdom ever be united, or will the consequences of his decisions forever tear asunder the fabric of Faeraven? An indrawn breath alerted Kai. Unsheathing his sword, he peered into the shadows beneath a weilo tree’s curling tresses. “Show yourself!” His challenge rang through the vale. Kai. His name sighed in a sudden wind that ruffled the waters of the weild. Morning mists eddied above the river, but the leafy canopy over his head remained still and silent. Impossible! And yet he knew that voice. “Shae?” With his heart beating in his throat, he pressed forward. “No. Release yourself.” Her voice broke on the whispered words. Jerking heavy lids open, Kai blinked against the weak light tilting through swishing weilo leaves. His dream had seemed so real. A moan sprang to his lips but died behind gritted teeth. Short, swift breaths relieved the tightness in his chest. His mind, however, knew no ease. He turned his head and met a pair of dark, rounded Elder eyes. He let his lids close to shield himself from their penetrating gaze. Emmerich’s murmur called him back from the edge of thought. He rolled onto his side and pushed to a sitting position. His companions, their shapes little more than shadows in the gathering mists of morning, bent over their bedrolls. Behind them the canyon walls of Doreinn Ravein rose into obscurity. At the expression of pity on Emmerich’s face, Kai balled his hands into fists and rode out a surge of heat. Shae might stand beside him now, but for Emmerich. As soon as the unworthy thought came, he pushed it away and forced his hands to unclench. Shae had willingly traded places with Emmerich at Gilead Riann. She’d sung her own death song by choice. And he, to his joy and sorrow, had urged her on. Without answering, Kai bent and rolled up his bedding. “Steady, Fletch.” Kai touched the neck of the winged horse beneath him and looked out over the frothing weild, which fell to rapids here. Sudden memory caught at him. He could almost see Shae combing her hair on the flat-topped rock at water’s edge. He signaled Fletch, and wings rose to enfold him like a feathered curtain. As the great wings lowered and they lifted on invisible currents to the top of the canyon walls, draughts rippled across him. At this height the mists thinned but would still hide their movements from any stragglers from Freaer’s forces retreating from the siege of Torindan. How would Lof Shraen Elcon, Faeraven’s new high king, react when Kai returned without Shae? He put the thought from him and focused, instead, on navigating the twists and turns of the canyons. They emerged into a flat land as the horizon blushed and the shadows lengthened to stain the eastern desert purple. The ground folded and rose beneath them, and then crested a rise. In the distance, past the broken peak of Maeg Streihcan, swelled the hills that Kai’s people, the Kindren, called Maegren Syld. The Elder nation knew them as the Hills of Mist. To the west, the kaba forest stretched to meet sandy shores where the tides of Maer Ibris ebbed and flowed. Torindan, fortress of Rivenn, perched on an arm of rock thrusting into Weild Aenor, the wild river of legend. Kai caught his breath at the sight. How long ago it seemed since they had left. Raena Arillia stepped toward Elcon in the dance, jewels and eyes aglitter. Her figure had softened since he’d seen her last, and the luster of her golden hair echoed the glow of her skin. He captured her by the hand and waist and turned her toward him. When she smiled at him, he forgot everything but her beauty. He clapped his hands in tempo, and Arillia swayed in a circle that brought her back to him. Dainty, light on her feet, and quick to smile, she reminded him of Shae. Elcon’s hands stilled, and his smile died. He’d tried and failed to reach his sister with the shil shael, the hereditary soul touch they shared. He could only hope she still lived. Without replying, he offered his arm to her. She took it without hesitation, and he guided her out of the crush of dancers toward the leaping fire in the nearest of the great hall’s three large hearths. Arillia’s parents smiled down upon them from the dais at the end of the long chamber. Shraen Ferran and Raelein Annora had conspired with Elcon’s mother to thrust Arillia and Elcon into one another’s company all of their lives. No formal marriage pact existed, but he and Arillia knew they were expected to wed. As children, they’d laughed at the notion many times. With a tug on his arm, Arillia brought him up short. “What ails you?” Such trusting eyes she turned on him, eyes of palest gray. She knew him well, but he thought she did not guess he used her company as a balm. In her presence, he found ease for the worries that tormented his rest. Her gaze probed his, but he glanced away, out the tall window behind her to the fieldstone paths that cut through the lush sward to the inner garden. Ah, the garden. They’d often whiled away entire afternoons gathering the roses that nodded beneath twisting strongwood branches. Side by side, they’d dropped bright petals into the silken waters of the pool and watched the water cascade in glinting ribbons from the tiered fountain. Her expression registered her disbelief, but he offered nothing more. For Shae’s safety, he couldn’t claim her as his sister. And how could he explain to Arillia the feeling of doom that weighted him? And yet, when he looked into the cool depths of her eyes, he could almost persuade himself she understood. The thought should draw him to her, but it only made him uneasy. Perhaps he and Arillia shouldn’t spend so much time together. Her eyes widened, but as he pushed her through the crowd toward the dais, she didn’t resist. His perfunctory bow to her parents included Arillia. He caught the glint of tears trembling on her lashes and hesitated, but then hurried across the great hall. Arillia, and all the confusing emotions surrounding her, would have to wait. Question 1: Why does Elcon at first reject Emmerich? Answer 1: Elcon objects to Emmerich's age because he feels insecure about his own position as a youth in authority. His recent troubles make him leary of Emmerich as an Elder. Elcon also senses the truth of Emmerich's identity, and because he fears losing his position over his people, he banishes Emmerich. Question 2: Why does Brother Robb refuse to let Aewen take a vow of celibacy? Answer 2: Aewen's request puts him in an awkward position. He sympathizes with her but doesn't believe she should take the vow. He also prefers not to cross her father, his King. Question 3: What are King Euryon's reasons for refusing to pledge his loyalty to Elcon? Answer 3: Freaer visited Euryon first and succeeded in confusing his loyalties. Also Euryon doesn't feel very attached to Kindren matters. He honors his own wish to remain neutral by promising not to align himself with Freaer against Elcon. Question 4: How does Elcon's attraction to Aewen differ from his interest in Arillia? Answer 4: Aewen's exotic beauty stuns Elcon, but he doesn't know her well. By contrast, his relationship with Arillia has grown over time but seems to him bland because of its familiarity. Question 5: Why does Aewen's mother dislike her servant so much? Answer 5: Because Inydde has lost touch with Aewen, she resents her closeness with Gaela. Her jealousy shows both her desire and her inability to love her child as she should. Question 6: When Elcon declares his feelings for Aewen, is he being loving or selfish? Answer 6: Although provoked by a combination of concern for her and Aewen's words, Elcon chooses to overstep the boundaries that separate them. He recognizes this fact later, when her father reproaches him and tries to put things right through his offer of marriage. Question 7: Although he blames himself, did Elcon really cause Aewen's death? Answer 7 Elcon certainly put in motion the series of events that culminated in Aewen's death, so he does bear part of the responsibility. However, Aewen chose her own path into hardship. Besides this, some of the blame belongs to Freaer for leading the attack that drove her from Torindan and to those who sided with him. And finally, part of the cause of Aewen's death was no one's fault.